We’d love your help. Let us know what’s wrong with this preview of Stuart Little by E.B. White. Stuart's greatest a A paperback edition of E.B. White's classic novel about one small mouse on a very big adventure! With black and white illustrations. To ask other readers questions about Stuart Little, please sign up. where do you photocopy this book ? where are some places in Stuart Little about gender preferences? Stuart says, "I'm afraid woman can't understand these things" in reference to his broken canoe. Strange little book. The premise is one I enjoy, as I've always been somewhat fascinated by unusually small things, and the notion of experiencing the world from the perspective of a very small being. So I loved all the little contraptions and whatnot created to help Stuart function in a human-sized house. However, the book kind of felt like White didn't really know what he was doing with it or where he was going with it. The first half of it consists of largely unrelated, episodic adventures aro Strange little book. The premise is one I enjoy, as I've always been somewhat fascinated by unusually small things, and the notion of experiencing the world from the perspective of a very small being. So I loved all the little contraptions and whatnot created to help Stuart function in a human-sized house. However, the book kind of felt like White didn't really know what he was doing with it or where he was going with it. The first half of it consists of largely unrelated, episodic adventures around New York, and then the second half develops a somewhat more cohesive plot as he embarks on his quest to find Margalo. Only barely more cohesive, though, as it too consists of a series of basically unrelated escapade along his journey. And then it just ends. No, seriously. It's like White just stopped writing in the middle of the story. We don't find out if Stuart finds Margalo, or anything about what happens to Margalo. We don't know how the Little family reacts to Stuart's departure, or if he ever makes it back. We just know he sets out on this quest, and that's it. It really feels unfinished, and I actually checked to see if maybe he died in the middle of writing it or something, but no. It was written earlier than the other two books included in this volume, so I don't know. Maybe he got bored? In any case, it's kind of bizarre. Also contributing to my sense that he didn't really know what he was doing with this story is the fact that, for the most part, aside from the fact that Stuart is a mouse born to a human family, everything is basically, well, reasonably plausible. The things his father builds for him make sense, the fact that he wears doll clothes makes sense, and even his sailing of the model ship is conceivable. Someone could be crazy enough to build a model ship that is fully functional, to the point of being crewable if only you could find a crew small enough. But then there's the little car. OK, there again, maybe you could be crazy enough to build a model car that actually runs on gasoline and everything. But this thing has an invisibility button. WTF? All of a sudden, this bit of complete outlandishness is just dropped into the story. And for no particularly good reason. The car goes invisible in its owner's office, crashes around for a while, and that's it. From that point on, it's just Stuart's little car. Never goes invisible again. And how it becomes invisible is also entirely unexplained. Weird. His encounter with Harriet, the two-inch-tall girl is also fairly random and fairly pointless. They meet, try to have a date, it doesn't really work, she goes home, and he continues his journey. What was the point of that? I'd have made her another mouse person like Stuart, and maybe they could continue to journey together or something. Instead we just had this random meeting (which was another instance of unexplained phenomenon - why is she two inches tall, but otherwise a regular person? If we're being asked to accept that Stuart's situation is conceivable, why not just stick with that? Why mess with it like this? ), for no particular reason. [Stuart:] whipped off his cap, lay down on his stomach, and dipped up some of the cool refreshing drink, using his cap as a dipper. "That's very refreshing," remarked Stuart. "There's nothing like a long, cool drink in the heat of the day, when you're travelling." Really? You feel the need to repeat that it's a cool, refreshing drink two sentences right in a row? Really? Maybe I'm overreacting, but that just seemed like really bad, lazy writing. A friend mentioned that this was one of her favorite children's books, and I realized I had never read it. It didn't pack the emotional wallop that Charlotte's Web did, but it's still a fun, sweet story. Stuart Little was born only two inches high and he looked like a mouse, but luckily his parents and big brother loved him anyway. The book is a series of Stuart's adventures, such as the time he got stuck in the window shade, or when he won a sailboat race in Central Park, or when he befriended a A friend mentioned that this was one of her favorite children's books, and I realized I had never read it. It didn't pack the emotional wallop that Charlotte's Web did, but it's still a fun, sweet story. Stuart Little was born only two inches high and he looked like a mouse, but luckily his parents and big brother loved him anyway. The book is a series of Stuart's adventures, such as the time he got stuck in the window shade, or when he won a sailboat race in Central Park, or when he befriended an injured bird, or when he volunteered to be a substitute teacher. At the end of the book Stuart sets off in a model car to find his friend the bird, who had flown away. The story ends with him heading north: "There's something about north ... something that sets it apart from all other directions. A person who is heading north is not making any mistake." The tales were nice, but they weren't as cohesive or as compelling as the story of Wilbur the pig and Charlotte the spider. What bumped Stuart Little up to 4 stars was White's writing, which had some lovely passages and details. During the sailboat race, for example, White explains that the West Wind "had come halfway across America to get to Central Park." Or take the bird, Margalo, that Stuart befriends. Stuart asked where Margalo came from. "I come from fields once tall with wheat, from pastures deep in fern and thistle; I come from vales of meadowsweet, and I love to whistle." What a description! I also liked the talk Stuart had with his students. In trying to figure out what to teach, the children say they usually study spelling. Stuart said, "A misspelled word is an abomination in the sight of everyone. I consider it a very fine thing to spell words correctly and I strongly urge every one of you to buy a Webster's Collegiate Dictionary and consult it whenever you are in the slightest doubt. So much for spelling. What's next?" 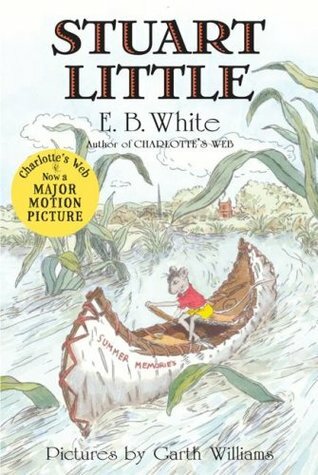 Stuart Little is a children's novel from 1946, by Elwyn Brooks White, who was also the author of the more famous "Charlotte's Web". However Stuart Little is a bit of a period piece, rather than a true classic. Stuart Little is a talking mouse who lives in New York City with his human parents, older brother George, and Snowbell the cat. He is a rather pompous sort of fellow, dressing in either a sailor suit or formal clothes, and affecting English manners - except when he speaks the American slang Stuart Little is a children's novel from 1946, by Elwyn Brooks White, who was also the author of the more famous "Charlotte's Web". However Stuart Little is a bit of a period piece, rather than a true classic. Stuart Little is a talking mouse who lives in New York City with his human parents, older brother George, and Snowbell the cat. He is a rather pompous sort of fellow, dressing in either a sailor suit or formal clothes, and affecting English manners - except when he speaks the American slang of the time. He forms a friendship with a beautiful little white bird called Margalo, until to Stuart's dismay she disappears, to fly North. The idea of tracking her down appeals to Stuart's spirit of adventure, so he sets off to find her. This the cue for all Stuart's rip-roaring adventures. They include quite a lot about canoes and boating, a romance with another tiny little female, and a jolly interlude where Stuart stands in for an absent teacher. The stories are told over 15 short chapters. The intext line illustrations are by Garth Williams. This was E.B. White's first foray into children's literature, and he claimed it was inspired by a dream. He was awarded the Laura Ingalls Wilder medal both for this novel plus "Charlotte's Web" in 1970. "When Mrs. Frederick C. Little's second son arrived, everybody noticed that he was not much bigger than a mouse. The truth of the matter was, the baby looked very much like a mouse in every way. He was only about two inches high; and he had a mouse's sharp nose, a mouse's tail, a mouse's whiskers, and the pleasant shy, manner of a mouse. Before he was many days old he was not only looking like a mouse but acting like one too - wearing a gray hat and carrying a small case." There have been two family comedy films based loosely on the book, featuring partly live action and partly computer animation. There has also been a television series. So is the book comic? Not in modern terms, although at its best it is droll. Is it an allegory? Perhaps. The little white bird clearly symbolises freedom. It's also all about learning to have courage, and developing as an individual; in a sense it's a coming-of-age story. The idea is appealing, hence the adaptations. Stuart Little is one of those books I used to recommend to parents when I worked in a bookstore. I liked “Charlotte’s Web,” and it’s undisputedly a classic. Robin William’s character in “Mrs. Doubtfire” reads it to baby Natalie (while this isn’t necessarily a ringing endorsement it certainly attests to the classical status of this book). And so, when baby Alice and I were choosing our book from the library last week it was between Stuart and something more modern like Funke. Because Alice was bo Stuart Little is one of those books I used to recommend to parents when I worked in a bookstore. I liked “Charlotte’s Web,” and it’s undisputedly a classic. Robin William’s character in “Mrs. Doubtfire” reads it to baby Natalie (while this isn’t necessarily a ringing endorsement it certainly attests to the classical status of this book). And so, when baby Alice and I were choosing our book from the library last week it was between Stuart and something more modern like Funke. Because Alice was born in New York and I liked the idea of her being able, unlike me until now, to say she’d read Stuart Little, the classic children’s novel, I opted for Stuart. My question is this: How many people out there HAVE actually read it? Having finished the book, I must say, I’m not sure I’d exactly recommend it. It’s not a bad book, but it’s not the best I’ve read, either. The book is episodic, which is fine. In fact, generally I prefer episodic for young children. They can take a snooze or have a distracted session and then still pick back up again and know the characters, but this one just seemed episodic…AND disorganized. I don’t think that’s overly critical. The book is creative, it’s well written, it’s interesting--but it is strange and chaotic and above all, disorganized. I think most people are fluent on the over all plot: Stuart Little is a mouse born to a well-to-do family of New Yorkers living in a two story apartment on (I think) the upper east side. Despite being slightly over two inches, Stuart is afforded his own room, which holds his bed, made out of a matchbox, and he enjoys sailing. Stuart doesn’t seem to have a formal education, but instead sets out upon rather manly, solo adventures at the tender (or ancient, it’s hard to gage for a mouse) age of 7, following meeting Margalo—a brown bird with a dash of yellow who sort of speaks in rhyme and takes solace in the Little family’s Boston Fern following some sort of accident. While it might be problematic that Stuart has fallen in love (and it’s never completely confirmed he’s “in love,” but crush seems too mild) with someone outside his own species, it’s never really addressed, mostly, I assume, because Stuart, like so many men in the 1940s, keeps rather buttoned up about his personal affairs. Mostly he watches Margalo and thinks nice thoughts about (her?) it. And, though most of Stuarts “adventures” seem to fall in account of Margalo’s abrupt departure from the Little’s home, there are a few things that happen before. Stuart attempts to sail “The Wasp,” on the Central Park Boat Pond, but runs into a squall and ultimately collision at sea with another ship, “The Lillian B. Womrath,” but he does make friends with the owner of “The Wasp,” a surgeon dentist whom becomes something of a mentor (and supplier of miniature vessels). Stuart also overcomes an encounter with Snowbell, the Little family cat—or perhaps it is actually an encounter with the Little Family’s rolling blinds, but either way, Stuart escapes. The aspects of the story I found troubling, or strange came later, once Margalo “flies the coup,” with Stuart in her wake. On his way out of town Stuart visits his friend the surgeon dentist, who offers him a bright yellow car that runs on “five drops of gasoline.” Fair enough, I say—a yellow miniature car from a man that already likes model ships—but here’s the kicker, even for 1943—the yellow car has an “invisibility switch.” Now, this is no Harry Potter, people—we’re not ensconced in magic. In fact, while the aspect of Stuart’s lineage is strange, it’s not presented as magical so much as just…maybe something that happens (as the book later presents the character of Harriet Ames, who is not a mouse born to regular-sized rich people, but a tiny but perfectly proportioned woman born to rich people). So we now have mouse with a tiny car that can be invisible. But Stuart accidentally hits the starter button while the car is invisible and wrecks it—sad, but not the weirdest part. Astoundingly, the next morning he is still able to drive the car, which apparently the dentist has made repairs to the night before. And Stuart doesn’t drive it invisible, instead he drives it, on main New York Streets, in full view. There are also a lot of people that seem to sit on curbs or in ditches. Perhaps this frequently happened in the 40s, but certainly it took us by surprise. Stuart generally encounters people, like himself, that are affluent or at least well to do in the gutters. Before leaving New York he meets a school superintendent who’s down in the dumps because he’s got to find a substitute for the day. Stuart volunteers, stopping first at a doll shop to by the perfect scholarly ensemble for the occasion. Decked out in tweeds Stuart arrives and keeps decorum in the schoolroom, despite being so small. And, while decorum is well and good, Stuart also decides to forgo the lesson plans and typical subjects like math and science in lieu of a heated discussion about being Chairman of the World and what laws could be universal (among the solidly “good” things presented are “the smell of a baby’s neck if it’s mother keeps it tidy,”). Once Stuart gets his fill of the discussion he splits, heading back to his tiny yellow car and leaving the city for northern skies and perhaps, if he’s lucky, Margalo. But Stuart again, somewhat conveniently meets another man in the gutter, this time near Ames Crossing (in Connecticut, it seems). The man suggests Stuart meet Harriet Ames, who is also small and well dressed. Stuart doesn’t seem too interested at first, but when he sees Harriet at the post office he hides and all thoughts of Margalo temporarily fly out the window. Instead he goes about arranging the perfect date with Miss Ames, including a tiny canoe and ice-cream spoon paddles. But when everything goes wrong on the date—it rains, the canoe gets messed up by some area children and the spoons are destroyed (Stuart seems most distracted by a string that has been tied to the toy canoe, making it clearly appear as what it is—a toy), Stuart is unable to recover. The cool Harriet shrugs and asks if perhaps they can go on and enjoy the date, rumpled canoe and rain, but Stuart is too worked up. In the end Harriet goes home to dinner and Stuart resumes his quest for Margalo. Why the intense play by play, you ask? Well, because it’s somewhat astounding, isn’t it? A conversation and stint as a teacher and discussion on chairman of the world, a date with a tiny woman (let alone her existence?) and a potentially invisible car—that’s a lot of plot action! But, then it’s just…gone as Stuart leaves Ames Crossing and returns his northern quest. However, he does meet a telephone repairman (sitting in a ditch, again, leading me to believe the world was once quieter, easier and workers allowed these “breaks”) who tells him a northern quest is never a bad choice. This is the first book that ever blew my mind - by far my favorite children's novel. One thing I look for in a book, I've realized, is a knockout ending - a book better have a good payoff. I don't want to spoil the ending here, but when my ten-year-old self got there, I couldn't believe it. How could E.B. White leave it like that? How can he leave so much unanswered? Moreover, how could he do that and still have it be so powerful and work so effectively? I still am moved every time I read the last This is the first book that ever blew my mind - by far my favorite children's novel. One thing I look for in a book, I've realized, is a knockout ending - a book better have a good payoff. I missed out on this as a child, but I'm glad I finally got around to reading this delightful tale of the intelligent, brave, kind mouse-child. I was surprised that it ended so abruptly, but since Stuart loves adventure so much, I guess it suits him. My favorite chapter was the one where he teaches school. The story is enhanced by Garth Williams' lovely illustrations. Excellent. How children's book should be. Lessons to be learned from an unlikely hero. Pure magic. Pure fun. Pure adventure. There was this scene where Stuart teaches a classroom full of kids; that was a touch of genius, pure gold. The ending was very whimsical, I liked it. No way its movie adaption could ever touch this fine work of art. I'm just glad I didn't read this book as a child or the idea that Mrs Little gave birth to a mouse, and everyone thinks it's strange but perfectly natural, would've really freaked me out enough to ask my parents awkward questions. I did not like two humans having a mouse baby. It does not seem to phase anybody else, though. Almost as soon as the day he was born Stuart Little was asking for brandy and smokes. Did Mrs. Little birth a grown man, ala http://www.youtube.com/watch?v=Pr216H... ??? No, she birthed a mouse, apparently. These are tall tales of a rather short stature, but that doesn't diminish their enjoyment. In his clean, straight forward style E. B. White laid down a loosely connected collection of stories about a charming little guy in a big world, using size to some good comic effect through out. On the Almost as soon as the day he was born Stuart Little was asking for brandy and smokes. Did Mrs. Little birth a grown man, ala http://www.youtube.com/watch?v=Pr216H... ??? No, she birthed a mouse, apparently. This book was good and kind of cute book to read. I have seen the movie and I thought it was a little bit better than the book surprisingly. I thought the writing was good and the story line though. Overall I thought it was a good book. Cute quick read. I wish it had a more defined ending though. this was a childhood favorite of mine and glad I introduced this story to my daughter when she was younger! When I was a child I absolutely adored Charlotte's Web. I read it over and over again and I absolutely adored the animated film (the original, of course.) I also loved The Trumpet of the Swan and read that several times as well. But thinking back, I don't remember ever reading this book before. I knew the basic concept of the plot and the movie version of the tale is well-known. But for some reason, this book never really stuck with me. Perhaps I started it and never finished it. I just don't re When I was a child I absolutely adored Charlotte's Web. I read it over and over again and I absolutely adored the animated film (the original, of course.) I also loved The Trumpet of the Swan and read that several times as well. But thinking back, I don't remember ever reading this book before. I knew the basic concept of the plot and the movie version of the tale is well-known. But for some reason, this book never really stuck with me. Perhaps I started it and never finished it. I just don't remember. Now I know why. Our girls really wanted to read this book, so we borrowed it from our local library. The narrative was a bit long and the overall feel of the book was rather old fashioned, but considering the story was originally published in 1945, it's easy to see why. Still, even with the excitement of the boat race and the invisible car, the story just doesn't have the charm or the sentiment of Mr. White's other stories. It has such a melancholy, almost depressing feel to it and it ends so abruptly. The illustrations are nice, and help to add to the old fashioned feel of the story, but they don't help the overall downcast ambience of the story. I was especially disappointed by the conclusion of the interaction between Stuart and Harriet. We read this book in the span of a week and then followed it up by watching the 1999 movie and comparing the differences in the stories. The two couldn't be more different, but it was interesting to discuss how movies can really change the nature of a story. Our oldest liked them both, but preferred the book. Our youngest said that she liked both the film and book for Charlotte's Web more than Stuart Little and I have to agree. Overall, it was an interesting story, but my least favorite by far of his three beloved classic tales. I was probably 7 or 8 the first time I went through this one, and have doubtless read it through 10 times since. One of those timelessly classic children's stories you just always go back to. It just hearkens back to a simpler America; makes me think of hot summers and lemonade and tire swings and reading on the trampoline in the backyard. I couldn't, I tried but couldn't add one more chapter after reading almost 50%. The characters are so hard to connect with, I loved Charlotte's web so so much but this one is a complete disaster for me. This was a sweet, quick and fun little read. I am absolutely in love with the character of Stuart Little! -My kids love it when I read this part very fast. "Have you any sarsaparilla in your store?" asked Stuart. "I've got a ruinous thirst." "Certainly," said the storekeeper. "Gallons of it. Sarsaparilla, root beer, birch beer, ginger ale, Moxie, lemon soda, Coca Cola, Pepsi Cola, Dipsi Cola, Pipsi Cola, Popsi Cola, and raspberry cream tonic. Anything you want." "Let me have a bottle of sarsaparilla, please," said Stuart, "and a paper cup." -I read this book with 3-year-old Ellen right after we moved to Rochester. I was feeling melancholy having just moved from a place and people I loved dearly. I was planning on giving Rochester a chance, but was still giving myself a mourning period. When I was going for an evening walk around our new neighborhood, I reflected on a passage from our night's reading, and it helped me decide to start letting Rochester into my heart a little bit. "In the loveliest town of all where the houses were white and high and the elm trees were green and higher than the houses where the front yards were wide and pleasant and the back yards were bushy and worth finding out about, where the streets sloped down to the stream and the stream flowed quietly under the bridge, where the lawns ended in orchards and the orchards ended in fields and the fields ended in pastures and the pastures climbed the hill and disappeared over the top toward the wonderful wide sky, in this loveliest of all towns Stuart stopped to get a drink of sarsaparilla." Wow how different this book reads in 2017 and as an adult. It was surprising more than anything else. Stuart is a bit brazen! He shoots guns off in the air on sail boats, he asks for a "nip of brandy," he runs away from home un-remorsefully, he shoots an arrow into the cat's ear, he sulks when things don't go his way... overall I was not too impressed with Stuart Little the way I was as a kid. Also his "adventures" seemed rather boring. Or maybe I am just too used to newer higher quality children' Wow how different this book reads in 2017 and as an adult. Also his "adventures" seemed rather boring. Or maybe I am just too used to newer higher quality children's books like Harry Potter. Was anyone else freaked out by the fact that at the beginning of the story, a pair of humans, having already produced one human child, now bring forth a mouse? And this is mentioned very matter-of-factly, without any attempt at explanation, e.g. the mother's DNA was accidentally combined with that of a rodent during a lab experiment gone horribly, horribly wrong. And if we don't choose to go the route preferred by Marvel Comics, one would expect some sort of fantasy-related back-story. At least Was anyone else freaked out by the fact that at the beginning of the story, a pair of humans, having already produced one human child, now bring forth a mouse? And this is mentioned very matter-of-factly, without any attempt at explanation, e.g. the mother's DNA was accidentally combined with that of a rodent during a lab experiment gone horribly, horribly wrong. And if we don't choose to go the route preferred by Marvel Comics, one would expect some sort of fantasy-related back-story. At least in fairy-tales, people who have animal forms are generally under some sort of spell, and after a series of trials and tribulations, recover their humanity in the end. Minor quibbles aside, this had a second-cousinish resemblance to the last book I read, The Borrowers. It was interesting to compare these approaches to the motif of vastly undersized people adapting to life in the everyday world. Except that one of these people is a mouse. My daughter and I read this out loud, chapter by chapter over the past two weeks. What a treat! I've never actually read the book, only seen the movie. I prefer the book. The movie I guess makes a more complete story, but I like the episodic nature of the chapters of the book. I also thought the writing was just magic. It was well written and Stuart is so well-spoken, and yet it was easy enough for my seven year old to read and enjoy. In Tom's words, "a delightful little read." Stuart appears with next to no explanation (just what he needs) and becomes the most helpful and genteel addition to his Little family. With a series of escapades - including a sailing incident, getting trapped in window blinds, and chasing a runaway invisible car - this diminutive hero eventually sets out to seek his fortune and find a lost bird. E.B. White's writing is quick and clever and his capacious imagination is something to be envied. I think In Tom's words, "a delightful little read." I think I read this when I was a kid? But as an adult I was very surprised to discover that Stuart Little is more akin to a somewhat moody middle aged man than someone's little boy. Second, I liked reading this classic more than Charlottes Web and other E.B. White books I've read to the kids. White's voice is smooth and descriptive but still intelligent. A New York City family unexpectedly has a mouse-child, and he discovers the unusual joys and challenges of life in the big world for a much smaller-than-average person. Listening to Julie Harris’s deft reading, I particularly enjoyed rediscovering the sailboat race and Stuart’s adventures on the road. Audiobook. I first came across EB White when I read ‘Charlotte’s Web’ last year in a beautifully illustrated edition. Continuing my journey across Children’s Literature, I picked up ‘Stuart Little’ wondering how I hadn’t read it before. After all, I identify myself with a mouse! ‘Stuart Little’ is another adorable tale, although it doesn’t quite have the depth and poignancy of ‘Charlotte’s Web’. But as with both the books, EB White touches upon ordinary values that are extraordinary to find these days - va I first came across EB White when I read ‘Charlotte’s Web’ last year in a beautifully illustrated edition. Continuing my journey across Children’s Literature, I picked up ‘Stuart Little’ wondering how I hadn’t read it before. After all, I identify myself with a mouse! ‘Stuart Little’ is another adorable tale, although it doesn’t quite have the depth and poignancy of ‘Charlotte’s Web’. But as with both the books, EB White touches upon ordinary values that are extraordinary to find these days - values of friendship, loyalty, sacrifice, and love. Above all, love. Stuart is a cute little mouse, alright, scampering from one adventure to another. The end of the book, I felt, was rushed and I really can’t believe that there is no sequel to this. Certain aspects of the book can be viewed in a harsher light - the way EB White makes fun of ‘fat’ people. Typical children’s stuff, I suppose, but the adult in me cringed at that.